There are some Disney characters that stay with you for your entire life. This can be a fair damsel from a feature film or a wily chipmunk from a cartoon short, or any of their ilk from the realm of animation. Going to Walt Disney World has always meant a place to finally meet these heroes and friends face to face, even if they are larger than life. For my part, however, there is a character that has always been immensely important to the way I understand the world, and he never even appeared on my television. The character, the only character created solely for the parks (and we can discuss out-of-the-park-characters like Colonel Critchlow Suchbench at a later date), is Figment. While he has undergone a variety of changes since popping into the Disney consciousness in 1983, the two tiny wings and eye big and yellow still remain the ever present face of the Imagination Pavilion in Epcot. Figment has been immortalized in both pin and Vinylmation forms, but to see the little dragon in an art form that truly encompasses his antics, just follow his footsteps to the Kodak What If? Labs of the ImageWorks and view the posters commemorating his frolicking. I think the general consensus is that Figment was created specifically to have a character in a park. It is one of the first characters to have a wholly created story as opposed to just being featured in the attraction. He was also a walk-around, which none of the other characters you mentioned are or have been. The Country Bears are probably the closest, in argument, to being created for a park, except they were created for the Mineral Springs Resort and located to the Magic Kingdom after Walt's passing. Figment has always been a favorite of mine since I met him in 1983. Just posted pictures of our meeting outside the pavilion. We have a special connection thanks to a bribe that got me on Space Mountain. The Hitchhiking Ghosts are in the Halloween parade, so does that technically make them "walkaround" characters? Always my favorite character. 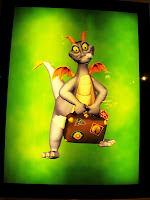 I even have a picture of Figment from the current ride as my desktop background at work. To me there can never be enough figment when I'm at Epcot. 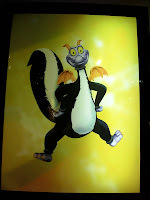 I also think that Tony Baxter likes to credit himself with creating the first character solely for a Theme Park--ever! Figment has always been my favorite non-Fab Five Disney character, so I was thrilled when I saw this article! Personally, I'm a fan of the yellow sweater-wearing Figment over the current version, but considering what Disney has done to his attraction, I'm just glad he's still around! I have always loved Figment. I still have a little stuffed animal version of him at home, and he was one of the first Trading Pins that I sought out. Matt, I'm glad you brouht all of those options up. I actually thought about writing up my perspective on why Figment is so unique in character development, but I was hoping that someone would open up the discussion. As George pointed out, I was using the Tony Baxter line of logic. While I agree that there are others who could be consider characters, epecially the Country Bears, the only official line from anyone in the company is Baxter's about Figment. George, Thanks for continuing the debate and seeing where I was coming from. Angel, I don't believe there is any bribe, even Figment, that could have gotten me on to Space Mountain after my first ride as a child. Tim and sclenyk, While Figment may have been the cat's meow back in the day, I'm just glad we still have him floating around at all. acooper, I think you're talking about the ImageWorks. It was one of my favorite areas to spend time in as a child, even the elevator seemed maigical! I believe the reason Figment still means so much to people today is that he had special meaning to the original concept of EPCOT Center and to the Imagineers who created him. He was not merely the supporting character in a larger story, or mere comic relief (as I believe he has become). That magnificent attraction was about Figment discovering his own creative potential... and all of us along with him. Figment WAS us. At the end of our trip he was revealed surrounded by images of his own life as an astronaut, actor, explorer, superhero... and the lesson was that we were all Figment, that we all shared his creativity and his amazing potential. The power of that identification has never faded. In the current ride he's treated as a nuisance, as an afterthought. Characters treated as such are usually diminished, but not our Figment... because we remember what he meant to us once. Isn't that the same thing that keeps us coming back to everything Disney does today, long after the man himself has fled the scene? Also when discussing Figment in relation to the other characters that are in the parks it becomes obvious to me that Figment is from a time period where character and story were generated "in house". Now many of the newest characters that are showing up in the parks are Pixar creations (yes I know they are "in-house" now). They have only a tie-in thematically at best rather than being essentially purpose driven creations. That he only exists in Epcot of all places I think makes him just that much more unique. Figment only exists in EPCOT because for the first few years, Dreamfinder & Figment were the only characters at EPCOT. It wasn't until the Eisner regime that Mickey and the Gang even got through the gate! 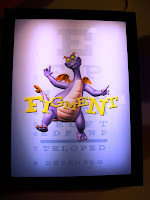 I miss the old Figment but I am so glad they still keep him around EPCOT. I would be devastated if they took him away.